Such an elegant creature, the shark - sleek, graceful, the perfect killing machine. And they&apos;re always very well spoken, I&apos;ve noticed. Fergus Pong has been hunting sharks for more than forty years on his Staffordshire Farm. "Not many people are aware of the shark&apos;s extraordinary leaping abilities," he says. 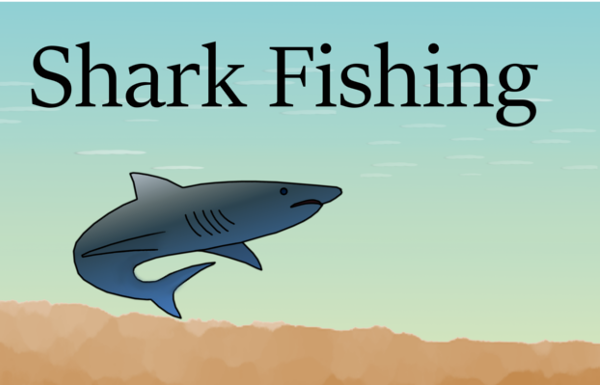 "It is not uncommon for the average adult shark to be capable of leaping straight out of the bloody water and hurling itself hundreds of miles inland." On average, twenty thousand sharks a week pass over Mr Pong&apos;s farm, seriously worrying the sheep. So what does Mr Pong do about the problem? "Well I shoots the buggers down, don&apos;t I? Course, I gets a lot of flak from conservationists and the like, but these people just don&apos;t understand what a nuisance the shark is. "They&apos;re vicious swines, see. You only have to look at one and he&apos;ll have your leg off. Turn your back for a minute and he&apos;s moved into your house and sleeping with your wife." Visitors to the area are often surprised to see 66 year old Pong stalking about his fields in the early hours of the morning, blasting away at bloody great fish with a pump action shotgun. But to the locals he is a familiar and reassuring sight. The Shark is a very large animal with big pointy teeth and a severe attitude problem. Given these character traits it is highly likely that anybody coming into contact with one will sustain some degree of injury. Shark bites can be extremely harsh. In many cases whole limbs are lost, and when this happens sticking plasters and antiseptic ointment often prove inadequate. The ancient Willamacoco tribe of South America used to smear the wound with warm buttermilk, but this is clearly a very stupid thing to do and I for one would never advocate such a course of action. In my experience the best way of dealing with a shark bite is not to get bitten in the first place, or indeed in any other place. This negates the need for medical attention almost entirely. The simplest solutions are always the best, aren't they? "Well I don&apos;t likes to admit it," says Pong. "But I think the folks round here sort of rely on me. Hell, if it weren&apos;t for me the place would be overrun by sharks in the space of a fortnight. "Think of it: frightening the kids, hanging around outside the chip shop, causing a fracas in the Horse and Jockey. There&apos;s nothing more dangerous than a shark when he&apos;s got a few Bacardi & Cokes down him. "I suppose I make it look easier than it really is. But your shark is a cunning fellow. They&apos;ve realised there&apos;s safety in numbers, so they often pass over here in flights of twenty or thirty, laughing and jeering as they go. But I still manage to take one or two of them out. "Just lately they&apos;ve taken to dressing up as Jim Morrison, Roy Orbison, or other dead rock stars, but it don&apos;t fool me. Elvis Presley got it in the neck last night." But Mr Pong has had his share of failures. A shark known only as &apos;Snappy McGibblet&apos; has been eluding him for some time. "Ah well, old Snappy. He&apos;s the ringleader, see, an old sly boots. I suppose you could call him my Nemesis. He&apos;s a master of disguise. I first met him when he visited me in the guise of a man from the council who&apos;d come about the drains. It wasn&apos;t until three hours after he&apos;d gone that I realised my dog had been eaten. I should have guessed really - the flippers were a dead giveaway. "But I&apos;ve got a message for old Snappy. They may seek you here, they may seek you there, but when I finds yer, I&apos;m gonna blow yer friggin&apos; head off."